Jordan James Pinkston (professionally known as Jordan James), an 18-year-old member of The Church of Jesus Christ of Latter-day Saints (sometimes incorrectly referred to as the Mormon Church), is a rising music artist who is making a name for himself. This Acoustic, Soul-Pop singer-songwriter and pianist from Utah is on a mission to change the world – one song at a time. Just ahead of Mental Health Awareness Week, which is 7 October through 13 October 2018, Jordan and three of his friends and fellow music artists – Yahosh Bonner, Aaliyah Rose, and Daysha Lassiter – recorded a song with a powerful message about suicide prevention. The video for the original song called “U Matter,” which was written by Jordan, was released on his YouTube channel on Saturday, 6 October 2018. Some of the singers from The Debra Bonner Unity Gospel Choir provided backup vocals. According to the American Foundation for Suicide Prevention website, suicide is the 10th leading cause of death in the United States. Each year approximately 44,965 Americans die by Suicide, and for every suicide there are 25 attempted suicides. It is estimated that suicides cost the United States $69 billion annually. On average, there are 123 suicides per day or 5 suicides per hour. In 2016, the highest suicide rate (19.72) was among adults between 45 and 54 years of age. The second highest rate (18.98) occurred in those 85 years or older. Also, in 2016, adolescents and young adults aged 15 to 24 had a suicide rate of 13.15. Jordan’s song, “U Matter,” is an anthem for those who may have contemplated suicide themselves or who know friends and family members who have. The powerful message of the song is You Matter! – – We All Matter! 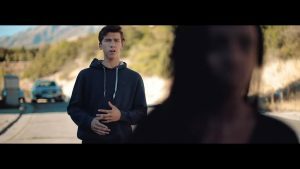 The release of the music video for “U Matter” follows the release of another powerful, original song by Jordan James called “Leave It to Me.” That song was released on Spotify and Amazon on Friday, 5 October 2018, and carries the message that we must learn to put our faith and trust in the Lord. We all matter to the Savior, and no matter what we may be going through in life, there is no problem that He cannot solve.